What Magical Girl Was Sailor Moon Based On? Over this past year of exploring all of the hidden histories and minor intricacies in the world of Sailor Moon, one point that we’ve continuously come back to is that nothing is ever quite as simple as it seems. Much like an onion, there are layers and layers of neat bits of trivia. So in honor of the one-year anniversary of this blog, I’d like to go back way to the beginning: what was the inspiration behind the magical girl known as Sailor Moon? Masked Heroine of Love and Justice? While obviously Sailor Moon was a unique series for its time, it isn’t exactly the origin of the fighting superheroine genre like many people assert. It most certainly popularized the genre, but there were quite a few that came before it (which I intend to do a write-up on in the near future). In fact, not much unlike the origins of Tuxedo Mask, the creation of Sailor Moon was more like a natural progression of the trends in children’s television programming — paying homage to the things that came before it in addition to telling its own story. So what is this Sailor Moon predecessor called, you ask? 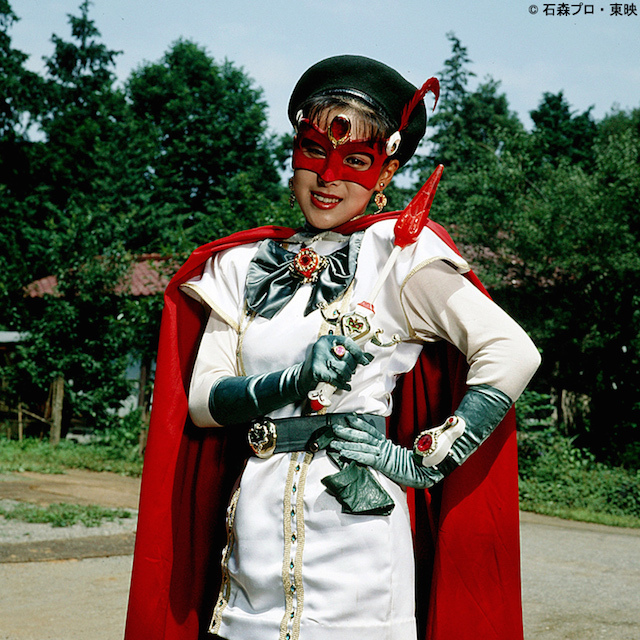 Well, let me introduce you to The Masked Belle Poitrine (美少女仮面ポワトリン; Bishoujo Kamen Powatorin).1 For the sake of simplicity, I’ll be referring to this as TMB Poitrine. 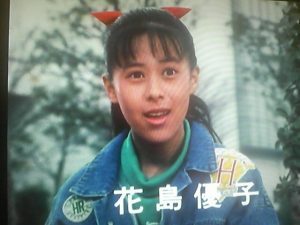 TMB Poitrine was a live-action magical girl show in the tokusatsu2 genre that aired from January 7 to December 30, 1990. I’ve briefly mentioned it in the past, but actually a great deal of the structure of the Sailor Moon series — and the anime especially — is based heavily on the tropes developed over the decades of tokusatsu production. Even the title itself — Pretty Soldier Sailor Moon — follows the decades-old Adjective + Noun + Name structure firmly established by years and years of tokusatsu series. Though TMB Poitrine was actually the eleventh installment in the Toei Fushigi Comedy Series,3 and third in their heroine-focused series, it was the first major tokusatsu series to star a consistent female lead from episode to episode who used magic to transform and fight the forces of evil. But before going much further, I should probably explain a bit about the series. Though ultimately not as memorable as Sailor Moon’s “In the name of the moon…” introduction, they do have a certain ring to them. Almost evocative of a certain other magical girl’s fight for love and justice, no? 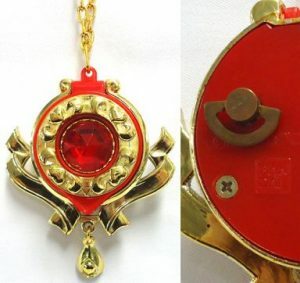 Musical Pendant: This is a pendant which, when opened, would play a melody like a music box and allow Yuko, upon uttering her transformation phrase, to become Poitrine. The pendant was worn on Poitrine’s bow like a brooch (sound familiar?). 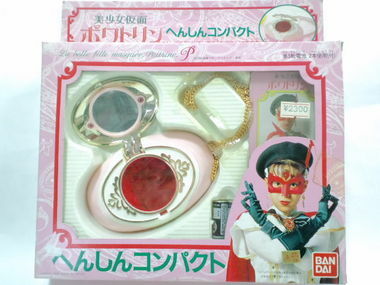 Transformation Compact: This makeup compact, which was used for her transformations in the latter third of the series, was sent to Yuko in the mail by the guardian spirit of the neighborhood shrine. Stick: … yes, a stick. For anyone who has ever wondered about why the first of Sailor Moon’s magical wands starts out with such a lackluster name as “Moon Stick,” you’ll be happy (?) 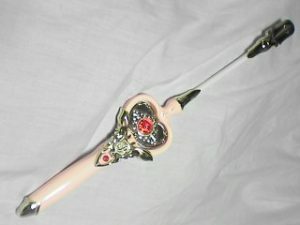 to know that magical girls in Japan have a long history of wielding weapons simply named “stick.” Poitrine was no different. So what was the lasting impact of TMB Poitrine? Well, the show itself was actually quite popular, averaging 15% viewership ratings during it’s run and even reaching as high as 18.9%. That’s higher than some seasons of Sailor Moon! But being a tokusatsu series, its popularity was meant to be short-lived from the start: one of the key characteristics of the genre is that old stories and characters are often retired in order to make room for a new one. Read also: What Crossovers Did Sailor Moon Have With Other Anime? Of greatest interest, though, is that Ms. Takeuchi herself admitted that Sailor Moon was influenced by TMB Poitrine.5 Though she didn’t elaborate one which parts she specifically borrowed from TMB Poitrine, even the masks worn by Sailor V — and in the original designs of Sailor Moon — look suspiciously similar. At the end of the day, this is yet another mystery that we will probably never get a proper answer to, but I think there is a lot to learn just by reading up on it. Even if the story of TMB Poitrine may not be directly applicable to the world of Sailor Moon, it at least gives us a deeper look into Ms. Takeuchi’s mind when she was fleshing out these characters we love so much. ← What’s It Like to Be a Sailor Moon Cosplayer? I only knew of the Cutey Honey connection. Nice to find out something new about the series. This is rather appropriately how I got into Sailor Moon in the first place. I remember being intrigued by the character when she turned up in ‘Movie War Ultimatum’ (I watch a lot of Kamen Rider). So I looked the series up. It’s sort of like a fusion between Sailor V and Tuxedo Mask. I can definitely see the parallels, especially with the later Live Action series. Though truth be told, and despite being much older, I personally feel this one held up somewhat better. Mainly due to it embracing it’s campiness, where as the later got a bit too soap operish. It’s fun to think what the original could have turned out like if it had been made a decade or two earlier. Unfortunately, I have to admit that I never had the opportunity to watch the show personally — all of what I know about it comes from research on Japanese fan sites devoted to the show. Considering the devotion of its following (and the fact that people even remember it this many years later!) obviously says something about how well the show has held up. Totally off topic, but one thing I find really interesting when reading up on tokusatsu is that, for the most part, they always star high school students. However, junior high school (and younger!) are the mainstay of anime and manga. I guess that it’s more a matter of practicality than anything else – considering that getting junior high school kids to be taken seriously as actors, to hold their own in fighting scenes, and to find stunt doubles near their size is a real challenge – but the PGSM live action series really stands out in that regard in that they really are supposed to be in junior high. Seeing as Ms. Takeuchi was ultimately okay with aging the cast into high school (though it took quite a few years to do that), I’ve always wondered what her reasoning for setting the characters in junior high was. I’ve already discussed why they’re in the second grade, but considering the strong tokusatsu background (and the mature character designs), I always felt like high school would have been a better place to start the series. Of course, it’s probably more related to the general age of Nakayoshi and RunRun’s readership, but still something to think about! Doesn’t Yuko/Poitrine also get a younger sidekick at some point? Poitrine Petite or some name like that? That would be Chibimoon’s counterpart, then? Trying to appeal to a younger audience by including a kid hero would not necessarily be a direct parallel, but from what I’ve seen of this series, the number of elements it shares with Sailor Moon is *scary*, so Chibimoon could still be a deliberate reference to it, to an extent (even if it wasn’t Takeuchi herself who came up with the character initially). That’s right! Her younger sister, in fact, becomes Poitrine Petite. I didn’t mention this in the article though since ChibiMoon only comes into the picture in Sailor Moon S, and at that point I think it’s fair enough to say that Ms. Takeuchi was telling her own story – though she may well have gone back and taken a look at the old show again! As far as for the appeal to a younger audience, I don’t think that’s the case with TMB Poitrine since the show only lasted one year, as was intended to just be a year-long story from the start. Probably they had planned on it the whole time, though I would like to see if there are any other cases of younger characters being added into other shows mid-season. The live-action version of Sailor Moon was written with just one story arc and a year-long run in mind, so they couldn’t put in Chibiusa without mixing in elements from later arcs (which the series was doing anyway, but with different characters). But Luna doesn’t get a human form until halfway through. There’s really no way to justify this character’s existence other that Toei wanting to include a kid guardian, she isn’t even an important part of the plot like Chibiusa was. Also, while it’s not obvious at all in the anime version (which left the story of Chibiusa getting her transformation compact completely offscreen), manga!Chibiusa was probably always meant to awaken as a guardian eventually, since part of her subplot involves her initial lack of powers, and she finally transforms during the climax of that same arc. This is really interesting. I wonder if the live-action Sailor Moon adaptation has any specific throwbacks to TMB Poitrine (other than what was already present in the past versions)? Ah, you’re absolutely right! To be totally honest, while I love the live-action PGSM series, my interest always kinda wanes around the time that Sailor Luna appears. It’s not simply that I don’t like her as a character — she was all right — but more that I felt like it was doing less “innovation” on the Sailor Moon story line and more “going a completely different direction.” Maybe I’m just getting old? Now that I think about it, I need to make a note for myself to look into the writing/production staff for PGSM. I was talking to my brother a few weeks back and he mentioned there were some interesting connections between the PGSM staff and some other famous tokusatsu. Worth looking into! From what I’ve read, Chibiusa was apparently the suggestion of Naoko’s editor, Fumio Osano. Who is sort of the unsung co-creator of the series. The Sailor Fuku being another. 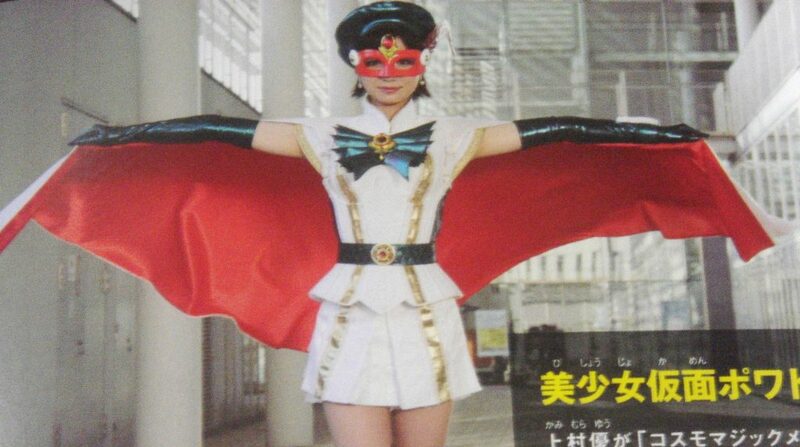 Funnily enough PGSM would also add Sailor Luna halfway through, as a sort of stand-in for the character. That’s one of the biggest differences between the Sailor Moon fandom in the West and in Japan, I think. Until this whole 20th (soon to be 25th? maybe?) anniversary resurgence, the series always has been directed towards, and enjoyed by, young children. In North America (since I’m not qualified to speak about Europe), the only time the series was really aimed toward kids was during DiC’s run of the anime. After that, it’s all been teenagers and adults. Now that we’ve got a few years since PGSM came out that the Japanese fans have grown up, I’d be interested in seeing if Sailor Luna’s popularity has lasted. Might’ve just been a “kid empowerment” thing. I’ll be honest, It does irk me somewhat when people sneer at ‘kiddie’ elements in something which was primarily aimed at kids. Truth be told, I don’t exactly have a very high opinion of fanbases in general, and the Sailor Moon one from what I’ve seen comes across as particularly dispiriting. Though the Japanese fans seem to be far more pleasant in general. I’ve seen examples of such unpleasantness even on here. Where they just seem to get so worked up over things they don’t really need too. It brings me onto a peeve I have regarding this condescending attitude a majority have towards things like dubs. And how the likes of anime (in its original language) was originally aimed at far more mature and older audience. When the truth is, the vast majority of it is aimed a children. Which is probably why those two characters never really bothered me as much. I personally find the hate for them has become quite overblown. Though I admit I do feel the transition from Luna’s generally maturer disposition into something more childish was a bit jarring. I get the impression it was implemented on very short notice. For Me, Mio was easily the bane of the show. She’s very much an example of an interesting concept horribly executed. Largely because the actress was especially bad. I just couldn’t help but cringe every time she was on-screen. She easily wins the award for the worst antagonist in the entire franchise as far as I’m concerned. What’s worse is the fact that she ended up being the final boss, in the form of a bad CGI plant. But PGSM is generally something of an odd duck for me. It did have quite a lot going against it. The shoe-string budget being the most obvious one. But I think that it’s biggest problem was how it couldn’t seem to settle on a specific tone. I can’t quite explain it, but it was like it was trying to be two different things at once. On one side it wanted to be this serious drama. But on the other you’ve got the more juvenile elements. Things like the wigs, awkward looking fight scenes, and of course Sailor Luna. And the show kept shifting back and forth between these two major extremes, never quite managing to find a middle ground. I think that’s probably why it didn’t do too well when it aired. The former content would have largely gone over the heads of the younger crowd. Where as the later would have turned off many above that age range. Where as say Poitrine had this more clearer idea of what it wanted to be. Being from the UK, anime wasn’t quite the craze as it was in say America. I didn’t have access to satellite until the mid 00’s, so I missed out on those boom years. Though Sailor Moon did get a very-very brief run on terrestrial, I’ve never actually watched the Dic/Cloverway dub bar the odd clip online. Over here, things like ‘Mysterious Cities of Gold’ and ‘The Moomins’ were very much our gateway anime.